Titan is in the spolight again! After astronomers spotted a passing geological feature, now a joint team from NASA and ESA found evidence that the moon may have formed before its planet. Generally, moons take shape after planets – but now, researchers have found convincing evidence that the nitrogen in Titan’s atmosphere originated in ancient conditions, in the cold birthplace of the most ancient comets from the Oort cloud — a spherical shell of icy particles that enshrouds the Solar System. The evidence they found was isotopical. Isotopes provide valuable insight into the origin of things – be them planets or rock samples. Basically, in planetary sciences, there are many cases where the ratio of one isotope to another can provide crucial information regarding the age of planets – the ratio of isotope A to isotope B tells you how old it is (sort of). Kathleen Mandt from the Southwest Research Institute in San Antonio and colleagues analyzed the ratio of nitrogen-14 (seven protons and seven neutrons) to nitrogen-15 (seven protons and eight neutrons) in Titan’s atmosphere. 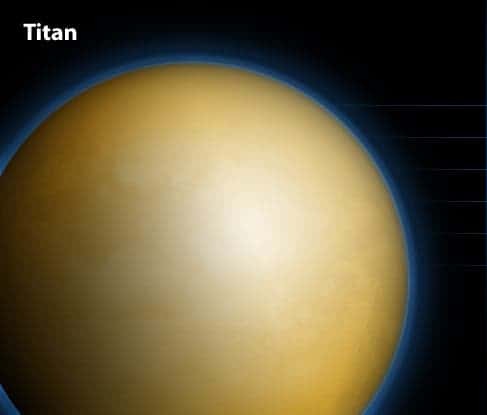 What they found was that the Solar System was simply not old enough for the isotope ratio to change like it has – which seems to indicate that Titan has its origin in the Oort Cloud. The Oort cloud is a cloud of predominantly icy debris believed to surround the Sun at up to 50,000 AU; if their results are correct, then Titan was created before the Earth and most of the Solar System as a dwarf planet and then was captured into orbit around Saturn. “This exciting result is a key example of Cassini science informing our knowledge of the history of [the] Solar System and how Earth formed,” said Scott Edgington, Cassini deputy project scientist at NASA’s Jet Propulsion Laboratory. The research was published this week in the Astrophysical Journal Letters.